This was another great class taught by Claudia at Sea of Beads. 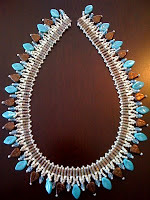 Ndebele Fringe is an extremely fast beading project. I had a lot of problems with my thread with this project. It kept fraying and knotting and I had stretched and conditioned in many times. I have decided this problem is related to the type of thread used. I'm becoming pretty partial to ONE G thread made by Toho but it only comes in 12 colors so I have to go with S-lon and it just was actually so hairy that I'd cut it and start new thread well before I was close to the end of the thread.